This is it! The end of the official Five Week Getting Started Bento Challenge. Or should that be the inaugural Five Week Challenge? Time will tell. In addition to telling us about your final week's successes and (hopefully few) failures, let us know how you see yourself using the forum in the future. Do people still want to post once a week to an [insert date here] wrapup/roundup/chat type of post? Do you have other ideas? Please let us know. My week started really well, I weighed in 900 g (~2lb) lighter than last Monday. That was very satisfying. My bentos got a bit boring towards the end of the week though, as I have been trying to use up bits and bobs from the freezer. I had a couple of fattening but delicious Thai green curry flavoured sausages that I made a couple of months ago, and a few meatballs that I made out of meatloaf mixture. These made repeated appearances. The two vegetable things I made on Tuesday night did too. Anyway, even if it wasn't very varied it was nice. I don't think I'll be losing any weight this week; our fruit deliveries started at work so I got a couple of kg of cherries and ditto of apricots. And I have been eating them. They may be healthy, but the calories add up when you make a pig of yourself. How can you help it though? The season is not that long and you have to eat them fresh while you can. I must construct a solar dehydrator this weekend. Mmn, the sausages sound delicious, and I just noticed the marvellous furoshiki cloths you have! I have posted my Week 5 report, as well as some thoughts on the Challenge as a whole. 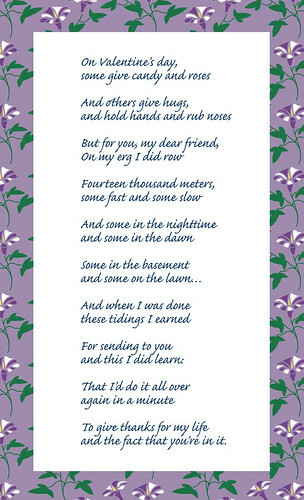 In a nutshell, I learned a lot myself! I'd like to take this opportunity to say a big THANK YOU to Bronwyn and Courtney, our intrepid moderators, for keeping the forum a nice and friendly place! And in case you were wondering, the forum is here to stay, even though the Challenge is over! Personally I need to take it easy forum and site-wise for a bit as we move, look for our next home, and so on, though I'll be around of course. (And I'm going to be hauling around my rice cooker on the road!) Besides the forum as just a place to chat and share hints and recipes and so on, I have a few ideas rattling around in my head as to things to utilize the forum, but for now I look forward to reading all your Challenge wrapup thoughts! I've really enjoyed the Challenge- I'm new to bento, and it's been good to get so much support and ideas from the community here- Thanks! I still struggle with the organizing my food for a week, and I don't always make a bento every day, but I think it's something I can improve on over time. Personally, I feel a bit neurotic taking pictures of my lunch, so I don't want to continue with a weekly report. However, if another Challenge came along in a while, maybe around June/July, I'd probably join in and try to do more advanced bento. Monday: My parents just came back from San Francisco (Sunday morning)! That’s why I had pirohzki and cherries in the bento. The chorizo rice recipe came from a collection of Good Housekeeping’s best recipes. But I only used 1/3rd of the amount of Spanish-style sausage and added a can of Purefoods meatloaf instead. 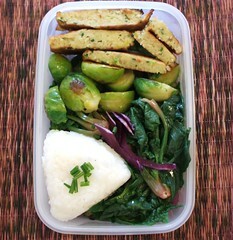 Tuesday: This is an easy bento I do regularly (around once a month). I make a lot of Menrui no Dashi and stock them in the fridge so all I really had to do was boil the noodles, steam the fishcakes, and slice up the takuan. It’s one of my favorite bentos. Wednesday: The lemon pasta with grilled chicken is adapted from The Neelys’ recipe from the Food Network channel. The original was a bit dry and they weren’t very specific as to how much lemon to put in. the recipe said “the juice of 2 lemons” but that can be as little as 2 T to as much as 6T. I think I went to about 5 T and 3/4 cup of olive oil and 1 cup of Queso de Bola. But it’s very tasty and my brothers loved it. The veggies are a simple salt and pepper stir-fry. The soy egg I made was a bit too light, I didn’t cook it long enough in the soy sauce but I was in a hurry. Thursday: My brothers had leftovers that day. I was only in school for half the day so I just packed a salami sammich and salad in my leafbloom collapsible sammich box. The little condiment bottle was from my Mom she got it at some restaurant and thought I might like it because it was small. So cute! Friday: I tried to make this a bit fancier than usual because it was Justin’s last day at his office (he’s moving to a new job). I think I put a tad too much wasabi in the sanma onigiri but apparently, he likes the tear-wrenching spiciness of it. Haha! This one has an umeboshi, so I obviously took a picture of my bento box. The boys’ get a soy egg instead. So that’s the end of Week#5. Thank you so much Maki for conducting this Bento Challenge! 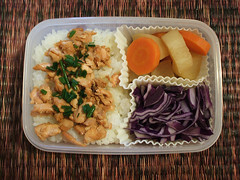 It was great motivation to make bentos often—if not everyday. Now… if only I can convince myself to turn on the treadmill and walk on it. SIGH. Ok - so this is how I have been coping. I tried taking pictures with my cell phone - they are crummy and I can't get them off the damn thing!!! I focused on trying new foods - mango mochi, Sharon Fruit, kumquats and Lady apples. The only thing I hated was the kumquats but now I am going to look at some recipes to make with them so they don't go to waste. It is sad to see a good thing end. I have used the 5 weeks to explore the whole idea of bento style eating, learning to use new items and old items in new ways and trying new foods. It has been a GREAT 5 weeks. - ongoing and some were weeded out to be used for a bento swap!! - done and I did NOT like anyone of them - I think I will not pursue this further. - done and on paper!!! YEAH!!!!!!! - 3 bentos made and photographed - can't get the pictures off the damn camera!! I really miss my cameras and miss sharing what I have made! * post here and write a report on my adventures! - DONE!!!!!!!!!!!!!!!!!!!!! I found out last week that making sandwich bentos really doesn't speed up my bento routine that much, however it does makes me feel more stressed since it is definitely harder for me to plan them and decide what's going in it... which is kind of weird. And while I wanted to enlarge my range of vegetarian/vegan recipe (I'm not a vegetarian, but I do understand why some people choose this option) for enviromnental and health reason, maybe it'll be better for me to apply this for dinner or on the weekends, when I can take my time to cook. I was feeling a bit tired at the begining of the week but it got better as time went by, and it shows in my bentos ! I named this one Blah-o-bento... nothing stood out taste-wise but the quick-pickled mouli, which is nothing new for me since I eat it pretty often at dinner. That's already better ! Now, it doesn't look like much and it's still a sandwich, but it effectively soothed my craving for a ploughman's. Moreover I had a treat (strawberry marshmallow)and while I don't eat this kind of cloyingly sweet treats very often, it perfectly suited my mood and the snowy weather on that day. Crappy picture, but yummy lunch. That's what I meant when I said "simple bento" : only a few items, but well-balanced flavors and textures as well as a quick assembly. I was agreably surprised by the addition of green peppers in the miso-marinated porc, and the quick pickled fennel and nappa cabbage with olive oil and lemon juice goes straight to my list of favorite pickles. Made under 15 mn, with leftover rice and porc marinated overnight. Surprisingly enough this bento was one of the easiest to put together, and definitely a hit. The key to variety here is the fact that all items were leftovers (already preped and huddled together in a corner of the fridge) exept for the kimchi fried rice and the miso-gochujang marinated fish... but even the plain rice was a leftover, and the fish marinated overnight. Made in 20 mns in the morning, but I could have cut that down to 15 if I had used frozen/de-podded peas. I wanted to make a celebratory/treat bento for friday, but uni got me in its claws. Like some of the people in the forum, I feel like time fleed in those 5 weeks. Or rather it's a bit like with some other things in life... you begin something thinking it'll be strenuous, long and difficult, and in the end you say to yourself "What, that's it ? It was not so at all." I don't now if it's because I tend to overestimate the difficulty of some projects, or because everything seems very easy once it's over, but it's not a bad feeling altogether. Anyway this challenge has been terribly helpfull in many regards, but I think I'll talk about this in another post in the challenge week 5 talk. I'll definitely be back for a celebratory bento at least, to round up the challenge ! And now that I have some time before me, I'll probably do a bento gear round-up as well as have a closer look to the contents of the other parts of the forum. I can't tell you how much seeing everyone's efforts and ideas helped me, it was a fantastic motivation ! Thank you all for this ! Interesting - I found it a bit stressful to plan sandwich-bento too! You'd think it would be a quickie no-brainer but it really isn't! Although this week illness has prevented me from cooking from Wednesday to Friday. I have done quite well in other aspects of the challenge. I found the challange was at a time where their wasn't enough free time for me to be turning out bento's each day (then again, I'm starting to think that I've seen the last of my free time), but I still found it fun and usefull. 1) To get into the habit of making bento's - I need to improve on this, but I think of it much more than I did before. 3) To help my brother loose weight. - Unfortunatley making a creature a healthy lunch and leading a horse to water are very similar exercises, eccept for the horse will sometimes feel like drinking. 5) To become healthier - This was more of a long term goal. I wasn't realy expecting much to happen during winter. But my bento's have been fairly balanced so I'm hoping to feel healthier once my body stops trying to hibernate. 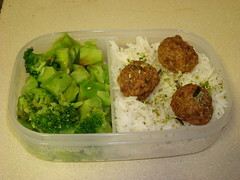 In addition, this week, I have made some miso soup balls and some salted seasame seeds, which should help with bento's. I plan to stock up with useful staples over the next week as it is half term. I don't think that I would be able to keep up with weekly reports unless there where specific challanges too meet, which I shouldn't imagine there will be for a while (or mabye at all *cry*). I do plan to rattle around the forum though, picking up (and hopefuly contributing) useful ideas, and taking part in any future challanges that may, hopefully, happen. This week was a bit like assembling together the pieces of a puzzle that in past weeks were all scattered (and hidden) around! Before the challenge, I was not new to the bento universe but I had not yet tried to make it my own. 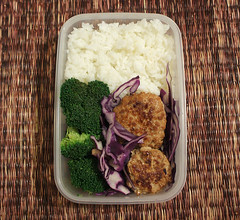 I used to look at bento related websites with great admiration but felt they were too daunting a task for me to make. The challenge was the perfect opportunity to learn while making new friends, and I think I became a real 'beginner'! At first I was a bit confused by the new things to do, but even more I was overwhelmed by the many things you need to think about when trying to organize better. After having 'survived' for 4 weeks, on the 5th I tried to take it easier and I focused on what I realized to be my most important aim/goal/challenge: having my meals arranged in a bento-style way at lunch and dinner, with all that comes with the bento-making process. I mean, I want to continue bringing my bento every day at work, but during this week 5 I arranged food in a bento-style also for dinner (exercise! ), on one single plate, and I realized it is a good way to pay attention to what and how much I eat. :: tried to put my lunch in a smaller bentobox and saw that it was ok! Lunch was still satisfying and I did not feel sleepy or too 'heavy' in the afternoon, I had my usual snack and I was in a better mood so ate more 'consciously' also at dinner (!!!). :: thought and searched in books/internet and magazines about correct food combinations and exchanged on it with a challenge friend who made me wish to search more!! :: and today, after dinner, got my bento ready for tomorrow and for week 6!! I mean, for me this is only the beginning and I'm still exited!!! My goodness is five weeks really over? My greatest accomplishment: the *fantastic* freezer stash I have built up- home made meatballs, rice portions, soup portions, mini-frittata, muffins, brownies, you name it! :: Napa Cabbage and Baby Bok Choy, with brown rice stir fry. And a few Ikea Swedish Meatballs, topped with Black Sesame Seed. Well, my five weeks were a bit of an adventure. At the very end of the year I moved to San Francisco from the east coast, and although I had been making Bento regularly at home in New England where I had an office job, the switch over became difficult as I waited for my bento supplies to come here (my boxes were shipped by my very very kind mother who staggered the shipments because I wasn't sure of the space I would have initially), as well as my new life doing most of my work from home. It turns out that making bento to eat at home isn't as easy. Nevertheless, I was relatively successful, making home made lunches for myself most weekdays, and making Bento three days a week for the boyfriend. They were mostly sandwich bento, and weren't sufficiently attractive enough for me to photograph and post, but some of them were really fun! I also put together my own blog (something I've been interested in doing for a while, as I write for several other blogs). I didn't really lose any weight, but certainly didn't gain any, and can now sufficiently walk up and down hills in San Francisco to my liking. I'm going to be starting the Self Challenge on the 19th, and hopefully I'll be able to focus more on the weight loss. I certainly will be using bento lunch to help! I'd love to continue posting wrap ups on the forum- Maki, thank you so much for putting this all together. (And thank you Bronwyn for moderating as well!) I can't express how fun it has been to see peoples lunches everyday, and have this little community! Week 5? The Challenge is done? But but but wah! Like everyone else has mentioned, the Challenge has literally flown by. And it has been GREAT. I have no idea whether I lost weight (I only got up the courage to weigh myself at the gym on Thursday) but everyone is saying I look skinnier so that's good enough for me. I've made a bento every work day during the challenge. For the last fortnight I've been making at least 2 a week for The Boy as well. We are converts to the whole bento ideal. We're eating better and feeling better and saving money too. 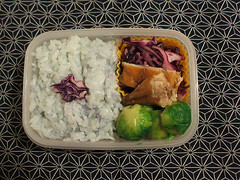 I am definitely going to continue making bentos and posting them on flickr! 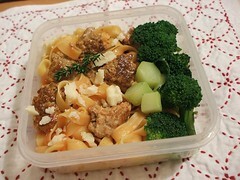 I going to aim toward more vegetarian bento, mostly for money saving issues but environmental as well. My reward for continuing until May (my birthday) is a new bento box for myself, since importing anything uber cute is a bit of a splurge. I've really enjoyed this challenge and it's been awesome meeting you all! Monday: Kung pao tofu and rice. 438 Calories. And my husband's lunch, he agreed to a bento. Tuesday: For lunch it was shirataki noodles, tamagoyaki, carrot kinpira, and asparagus. 382 Calories, I will stick to regular brown rice from now on I got quite hungry in the afternoon. And for dinner it was a peanut butter sandwich on whole wheat, and sliced bell pepper. 505 Calories. Wednesday: Brown rice, triple soy loaf, carrot kinpira, and asparagus. 540 Calories. 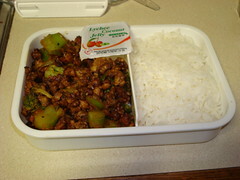 Thursday: For lunch I had brown rice, curried chickpeas, carrot kinpira, and brussel sprouts. 432 Calories. And for dinner I had black bean burgers on whole wheat, with lightly steamed carrots and sliced bell pepper. 478 Calories. Saturday: a bonus bento, the hubs took me wine tasting for Valentine's Day. The zucchini spirals with the curried chickpea centers were very yummy. Here are my lunches for the week. I continued to make three bentos a week. For Monday, I made stir-fried broccoli with gochuchang and crumbled tempeh, rice, and a lychee-coconut gel dessert. Total calories: 488. 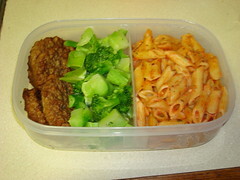 Wednesday's lunch included leftover whole-wheat penne with a reduced-fat tomato Alfredo, vegetarian sausage patties, and steamed broccoli. Total calories: 376. Friday's lunch had steamed broccoli (as you can tell this is one of my all-time favorite veggies) with Maggi seasoning sauce, rice with furikake, and vegetarian meatballs. Total calories: 375. This challenge went by so fast, but I learned a lot and become a bit more confident in my bento skills. Pre-planning my lunches and utilizing leftovers was a huge help in terms of keeping my meals cost-effective. I also wrote up a list of items for my bento stash, organized by category (protein, carb, veggie, seasonings) to make the planning easier. Additionally, I find it more convenient to prepare the lunches the night before. In terms of my weight loss efforts, bentos are an excellent tool for me. For the past couple of years, I've made a habit of regular exercise, but I had problems exercising proper portion control. When I started ordering actual bento boxes and sets, I was a bit surprised by their small size. However, I've come to realize that they really do store a reasonable amount of food. Overall, I thought this challenge was really fun and beneficial. I don't know how I'm this late with my week five wrap-up; it was a very busy week I guess! The week went great --I've continued to make bento each day, and one day I brought a second (identical to mine) bento for my laoshi, which he very much enjoyed; that was really nice. I'll keep on photographing my lunches, and posting them to the pool, and I will keep on making bentos and participating in the forum. This whole endeavor has been incredibly enriching: I love the recipes I learn from Maki and from fellow bento friends, and I love making new friends who are so creative and warm and encouraging. * Dinner bentos for Tuesday - I did manage to put one together (steak sandwiches with bleu cheese, and black bean soup) and it was delicious! * Use of leftovers, and starting to put up a stash - Definitely met this goal. I also organized my fridge and freezer, hooray! Leftovers are something that I will still need to rely on for our own personal bento meals, although since I've started making bento for others I realize that I probably shouldn't rely on leftovers for their lunches...! * Finish a draft of a plan for offering my bento-making services to additional coworkers - I'm still working on this draft tonight...and hoping to get my first order form out this coming Wednesday. Overall, participating in this challenge has been very inspiring for me, and one of the most positive outcomes is that I have now started making bento lunches for my coworkers, for a price! I am currently only making lunches for one coworker, but I plan on expanding to include additional "customers" starting the first week in March. It's been a bit of extra work so far, but a lot of fun, and this website has been a lot of help in that regard - thanks, Maki! And thanks to all of you for posting and giving me tons of great ideas and encouragement, whether directly or just by participating in this challenge. I plan on sticking around and posting pictures and participating in the forum when I can, although I have found lately that my life (a lot of which involves bento prep, actually) has kept me offline for the most part. We'll see!